Man, what's in Leo's hair to get it to stand up like that? I would very much like it if my hair would do the same thing! Here's to an aweseome day for L, M's unquenchable glitzy-girliness (and doing so much better in school! ), and I's continued brilliance. @tadpoledrain: It's Cetaphil lotion, which I then dried with a hair dryer (and he tolerated!). If Gwedomama sees this she will snicker knowingly. @Niksmom it was an awesome day! A hard start, one accident, but overall a good transition. Thanks. The Leelo 'do is awesome. So glad it worked. tadpoledrain I recommend d:struct, the stiff wax kind, no hair drying needed and it doesn't get crunchy like hair spray. squid I hope you like Fistful of Sky - it's odd and I wasn't quite sure it would be your cup of tea ! I have another rec. Iz might like The Hunger Games. 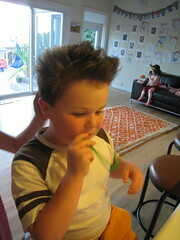 His hair is cool enough to mesh with the big kids! You probably already got the answer on SF, but if not, the city and county lines are the same. I interned with Angela Alioto many years ago.